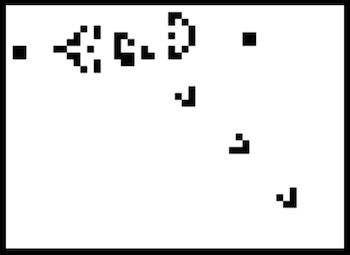 Here’s a web-based version of Conway’s Game of Life. The rules are the standard recipe but I’ve added colour a color effect to the cells. At startup the cells are assigned colors with random hues. Newly-created cells take the color most similar to the neighbouring cells. When cells die I leave a trace of their color in the vacant cell background. Adding color makes the simulation more striking, and it also vividly illustrates how local patches of the simulation share common ancestry. Conway’s Game of Life is a wonder of mathematics. Invented by mathematician John Conway in the 1970s, it isn’t really a game but a simulation experiment involving squares in a grid (‘cells’) that are either ‘live’ or ‘dead’. Any live cell without two or thee neighboring live cells (including diagonals) becomes a dead cell on the next turn (or ‘generation’). Any dead cell with three neighbouring live cells becomes live on the next generation. From those very simple rules arises a fascinating array of complex behavior. The menagerie of structures and creatures that can emerge has been studied continuously since Conway invented his game. You can read all about Oscillators, Spaceships, Reflectors and more on LifeWiki and elsewhere. The small library of Life shapes that I include in my simulation were borrowed from the excellent resources on LifeWiki. Life is one of those ideas that is so simple it begs for variations. For my project I decided to make an implementation that kept the basic Life rules but added colors to the cells. When a cell is newly-created a hue is determined which is formed by summing a 2D vector for each of the three live neighbours’ hues; representing the position on the circumference of a circle where the angle represents the continuous hue value. The hue of the new cell is taken as the angle between the origin and the end of the combined vectors (using Math.atan2). This way an ‘average’ can be obtained that does not tend towards any locality on the color spectrum. As the simulation is so computationally extensive it can act as a benchmark of sorts between browsers. At the time of writing, Safari on OS X was giving the fastest results. The source is available on GitHub and has a GNU license. As always, any comments or enquiries are welcome here or at jimblackler@gmail.com.